It started something like this: I was lounging on a rainy day in Yosemite about a year ago when I somewhat sarcastically said to my buddy Nick, “Hey, we should go ice climbing in Nepal someday.” His response took me off guard as he immediately responded with, “Sounds great! How about next January?” And that’s how it began. We saved some cash, bought two plane tickets and gathered up our gear. We flew into Kathmandu and neither of us had any experience with the logistics or the planning pertaining to climbing in such a remote place for an extended period of time, but we figured we’d just wing it. We didn’t bring enough food. We got off the bus in the wrong city (along with our 330 pounds of equipment). And for the first week, nothing went as planned. But as is often the case when traveling in this part of the world, it wasn’t so bad as you remember to forget the expectations and just go with the flow. Next thing we knew we were in a Nepalese valley full of frozen waterfalls capped with big peaks. Yippie…we arrived and we were ready for some Himalaya ice climbing! One of the routes we climbed we named “Paul Revere” (III WI4 500’) as it was the first big chunk of ice we saw on our trek into the village with our porters. And quickly upon arrival, Nick and I decided we needed to walk back down valley and hop on it. On the approach we saw locals with their baby goats, found a key bridge, and bushwhacked through some bamboo. 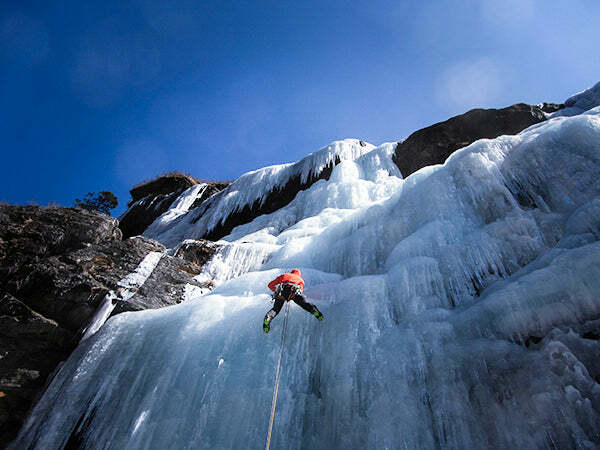 Yes, bamboo on an approach to ice climb…unbelievable! There were two routes right next to each other and we chose the left side because it looked a little more engaging. 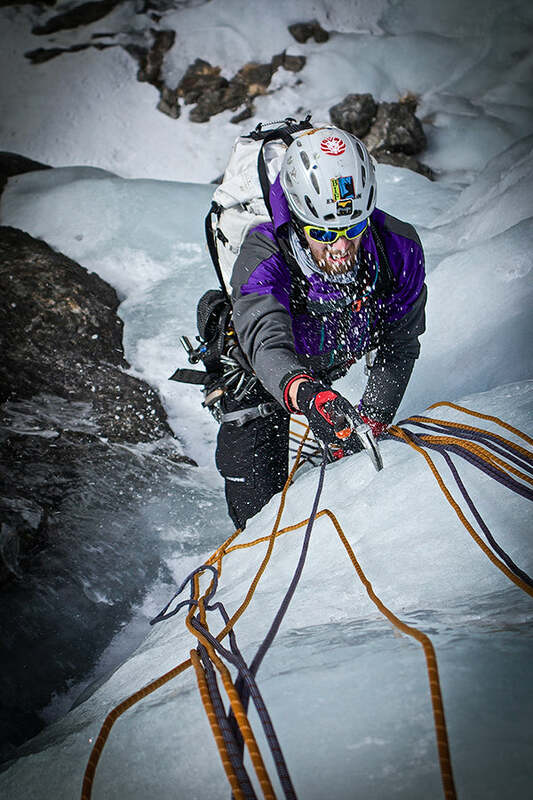 We soloed up some mellow approach ice and geared up at the base of a stunning 40’ curtain. Nick took the reigns on the first pitch and cruised up the brittle curtain and continued up a ways to a belay. I then led another rope length through some bulges and brought Nick up. We were nearly at the top and a narrow choke of ice guarded the finish. Nick made quick work of the choke which turned out to be awesome climbing. Next thing I knew we had run out of ice and began our rappels. We were pulling the ropes on the last rappel and as the rope was about to pull through the v-thread, it hung up. Damn! I immediately thought we forgot to untie a stopper knot but then remembered that wasn’t possible as we had just doubled checked the ends of the ropes before pulling. 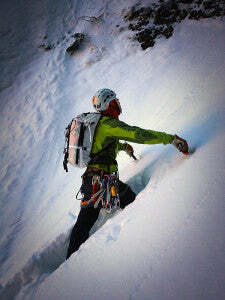 The easiest option was to re-lead the pitch on one rope and I was lucky enough to get the lead. At the spot where the rope had hung up, I realized that rope had a mind of its own. It had “crawled” pretty deep in a depression where the rock met the ice, found the only icicle in a fifty foot radius and neatly “tied” itself around it. “Nice work rope”, I thought. Then I went to bashing out all the ice in the depression to combat future issues. I rapped. We pulled the ropes, high-fived, and we walked back to our “house”. We were in Nepal for a total of 35 days, climbed some incredible frozen water among some amazing landscapes, and met many of the very few local residents (we were staying in a ‘spring/fall’ village in the middle of winter when most residents were down valley for milder temperatures). And when not on the ice, I think we figured out nearly every way to prepare rice and lentils while we played cards and rationed Starburst. During a little over a month of Himalaya ice climbing, we hit routes varying in difficulty from WI3 to WI5 and 200’ to over 1000’. Sometimes we were basking in the warm sun and other times we were dealing with the screaming barfies. But overall, it was an epic journey! The post Himalaya Ice Climbing appeared first on Hyperlite Mountain Gear Blog.